Being part of the petite club (I'm 5'4"), I always felt a midi skirt was not in the cards for me. I love the way it looks on everyone else, but I am forever saying "It looks good on them but it won't on me." But I am never one to shy away from a fashion choice just because of fear, so I found this gorgeous one at Zara and I grabbed it immediately. It was initially too big in the waist and I prefer it to sit up high on my waist so that it falls just below my knee. Any longer than that and it would be super frumpy. No frump allowed! So my tailor took it in just a smidge and it now falls at the perfect length. The only thing I realized after wearing it for the first time is I do need some sort of heel - flats will not work with it. But if that's the compromise I have to make to wear such a fun skirt, I will happily oblige. And happily twirl. 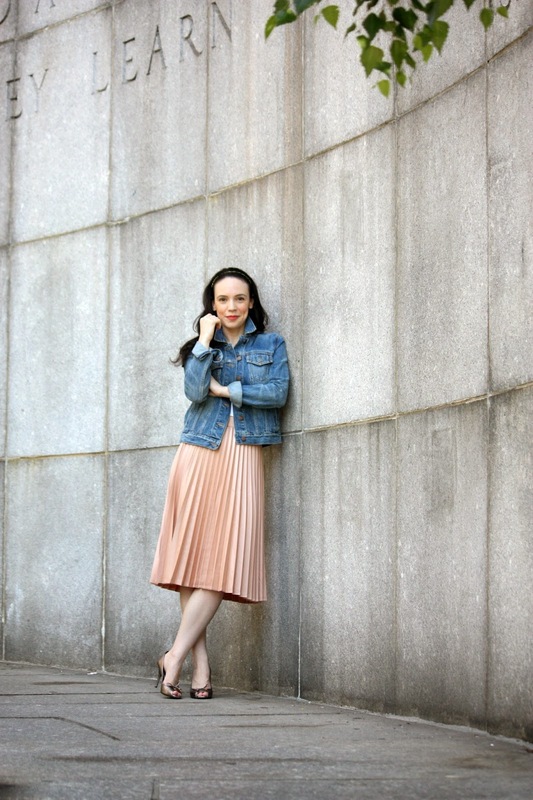 An accordion pleated midi skirt cannot be worn without twirling. Looks gorgeous on you and I bet you'll be wearing it more than you thought you would. Just one question though, how does one appropriately launder a skirt with this many pleats without having them end up a wrinkled mess? You really suit the skirt! It's such a pretty colour!